The Joint: The Milk Bar, 561 Columbus Avenue at 87th Street, Manhattan, New York, 10024. You can find their website (including cookie recipes) here. 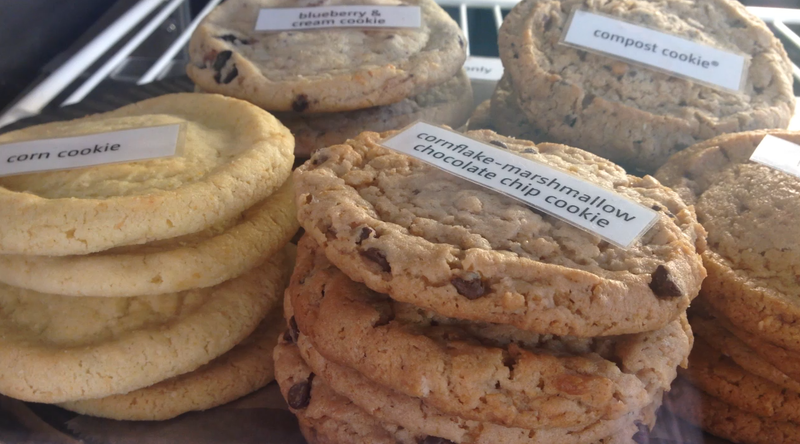 The Vibe: The Milk Bar, found on 87th and Columbus in Manhattan, is a joint dedicated to cookies, pies, cakes, and good coffee. All excellent additions to your lunches, I’m sure you’d agree. This low-key corner café is part of the Momofuku group, more famed for their excellent noodles, and one of six dotted about New York. 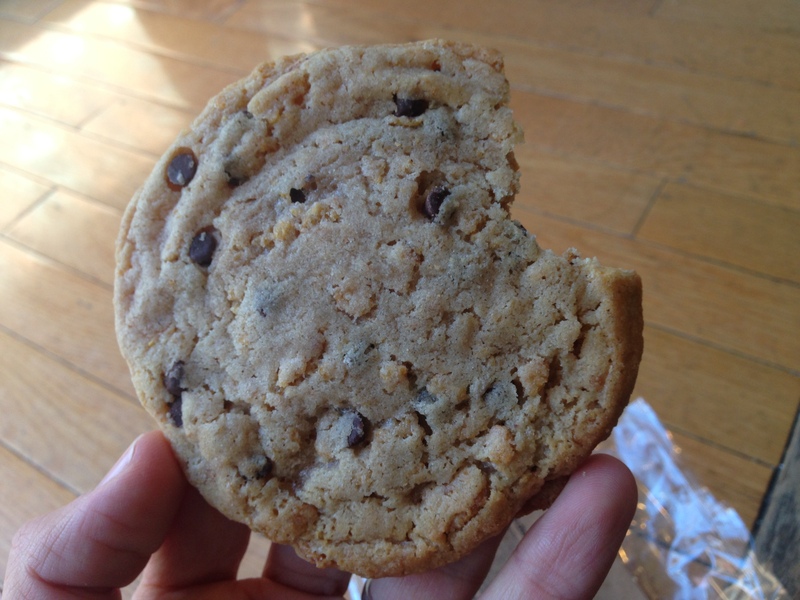 We enter on a quiet weekday and take advantage of their three cookies for $5.50 deal – choosing peanut butter, compost, and cornflake chocolate chip marshmallow. The peanut butter cookie is, as you’d expect, rich in flavour and delightfully chewy. However it’s the compost and cornflake varieties that really grab your attention. The Compost cookie, also known as ‘garbage’ and ‘kitchen sink’ due to the volume of snacks thrown into them, contain pieces of chocolate and butterscotch chips, potato chips, pretzels, graham crackers, and coffee grounds. It works well though and has a really satisfying weight behind it too. The cornflake chocolate chip marshmallow cookie takes the biscuit though. The name gives away many of the ingredients but it’s the added brown sugar, vanilla extract, and butter that gives them the edge. As we tuck into a second helping of cookies (the blueberry and cream this time) we note the cook books and cookie mix on sale in the corner, the free snacks for dogs, and the adverts for their weekly ‘cake walk’ competition. It gives a great community feel and really does add to the relaxed atmosphere. 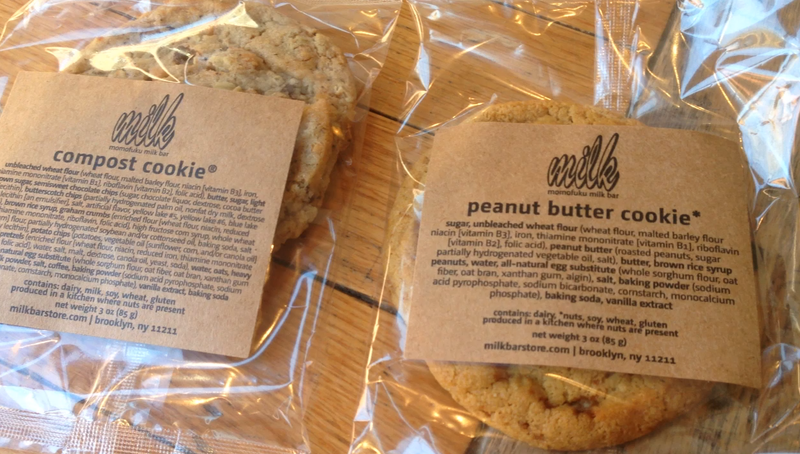 If you’re looking for the best cookies New York has to offer then head to the Milk Bar on 87th Street. You won’t be disappointed. 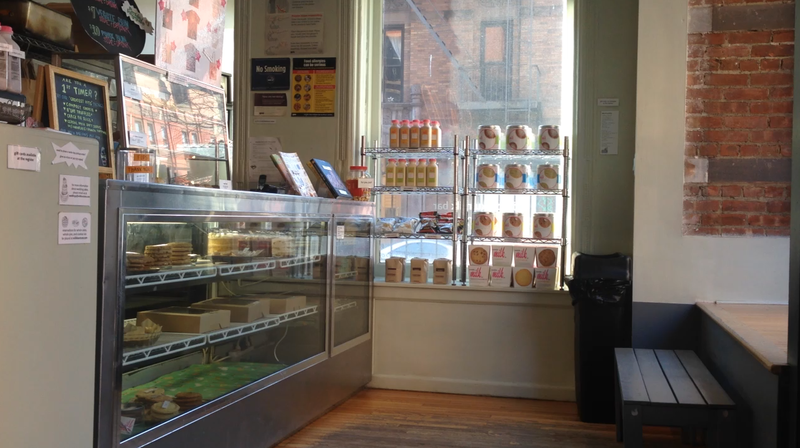 The Milk Bar was visited by Tom in February 2015. Posted in New YorkTagged 87th street, biscuits, blueberry, butterscotch, cakes, chocolate chips, coffee, columbus, compost, cookie, cookies, cornflakes, cream, Food, Manhattan, marshmallow, milk bar, momofuku, New York, NY, peanut butter, pies, potato chips, pretzelsBookmark the permalink.